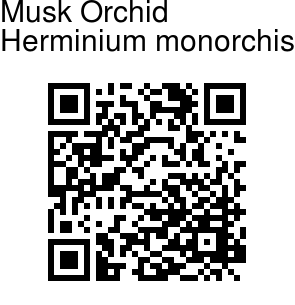 Musk Orchid is a slender perennial ground orchid with an erect, usually lax, spike of tiny greenish-yellow, honey-scented flowers, each 2-3 mm across. Petals and sepals are somewhat converging, but not forming a hood. Lip is 3-lobed, with 2 lateral lobes projecting at right angles or curved forward. Mid-lobe is shorter. Lower leaves are elliptic oblong to linear lanceshaped, 2-7 cm long. Upper leaves are bract-like. Stem is 7-15 cm tall. 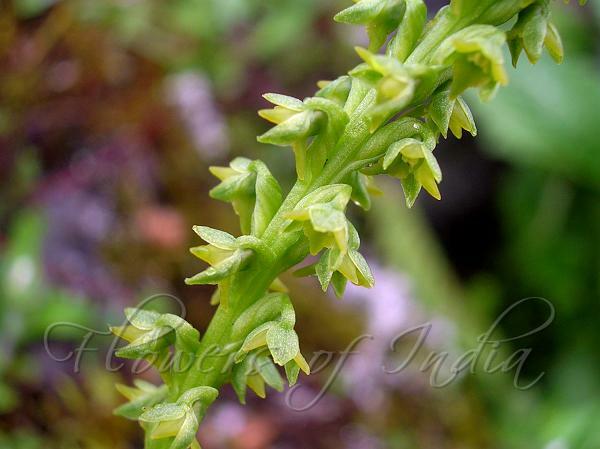 Musk Orchid is found in the Himalayas. from Pakistan to Nepal, Tibet and China, at altitudes of 3000-4300 m. Flowering: June-August.